It's that time of a week again - time for my weekly recap here. I hope you loved last week, and I hope you will love my recap, which starts, well, now. The week started with another Tribute release - this time we got Balmain Tribute. The store and the items are really in-ordinary, unusual and specific for inspired designer. We have many short and interesting, unique dresses, some nice accessories, and even a guy outfit, (2 to be exact). Even I love some pieces, they seem, at least to me, kinda hard to use in outfits. They are not a type of everyday items, more like holiday items. Well, holidays are approaching fast, so you might want to have a dress or 2 for the occasion. Overall, nice collection, great for collectors, but hardly wearable. On Wednesday, Stardoll released new Christmas themed store, named " 'Tis This Season"
The store is, obviously, filled with Christmas themed stuff. We got 2 X-mass trees, and all sorts of decorations, from lamps, candles, snowglobes, etc. Perfect for those who want to get into holidays spirit, add some stuff from previous Kitch release, some old stuff in storage you saved from last year, and you can have a great room. Unless you are like me, and have zero talent for decorating. Anyway, I really love the store, it's so festive, bright, colorful and brings positive emotions. 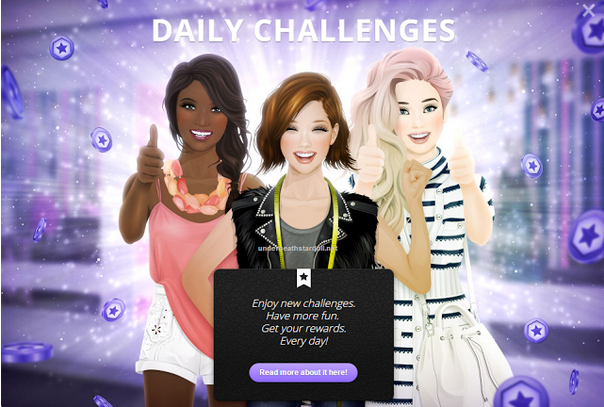 The same day, Stardoll added a new feature - daily challenges. It seems like the purpose was to, instead of full academy year, we get daily tasks and upon completing them, we'd get starcopins and starpoints. 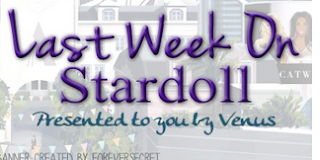 But I really wish Stardoll has tested the update before making it live. In case someone is reading, first, we have 5 or 6 sets of tasks which change often, whether you have completed them all or not. Second, I think we were supposed to get 1 set of tasks per day, not 10. Also, some require us to buy stuff, and I don't have problem buying gifts for friends, but to buy make up, as one task requires, you'd need at least some stardollars. Also, sometimes you will get a task to submit a photo to The Vote, and then in next set of task, they ask you to do the same thing, which is impossible. And last, tasks are redundant, like I mentioned, we have 5 or 6 sets of tasks which change often, and that's all. So I really, really hope a member of Stardoll staff is reading this and will work on updates. And on Friday, an 'ordinary' release in It Girls store. The store is filled with winter themed stuff, (well, mostly) - we got sweaters, jackets, scarfs, but there are also other items, like skirts and dresses. Not many seem to pay attention to those collection, as (me included) are rather impressed with limited and realbrand stuff, even though you can find some really nice gems in those, so called 'ordinary' stores, to make a nice, cozy outfit. This collection has it all, and I wish I'd bring myself more to spend my stardollars on stuff like that. Anyway, that sums up the week. I hope you enjoyed it. Next week, we can expect some really nice stuff, according to spoilers. Also, we are hoping for an update on daily tasks, new Callie's Picks.. well, we'll see. Until then, vote, comment, and see you all next week.